As a developer, we sometimes need to write code for checking overlapping. 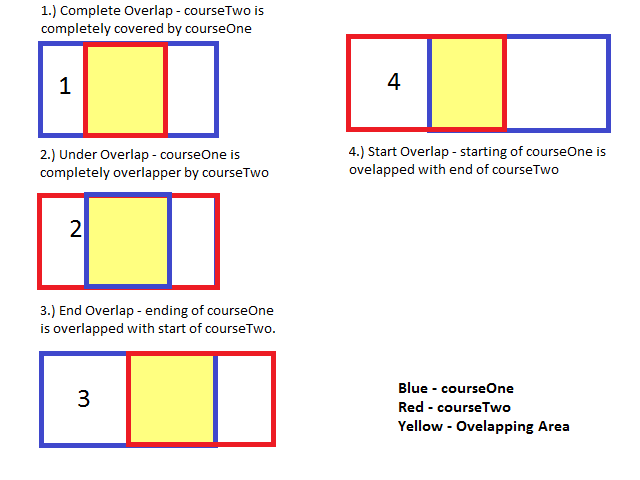 We check overlapping for two objects having one start and end point (Overlapping between two appointments, overlapping between two courses, programs etc). For example lets take a Course as object, So Course has a Start Date and End Date. Now we have given two courses, “courseOne” and “courseTwo”, now we need to check whether they are overlapping to each other or not? Let’s start some analysis on possible overlapping between courseOne and courseTwo, there are four possible use cases when courseOne and courseTwo can overlap each other. 1.) Complete Overlap : When courseOne completely covers the courseTwo i.e. courseOne starts before courseTwo and ends after courseTwo. So in coding we can write this condition as. 2.) Under Overlap : When courseTwo completely covers the courseOne i.e. courseTwo starts before courseOne and ends after courseOne. We can simply say its vice-versa of complete overlap. In coding we can write this as. 3.) End Overlap : When ending of courseOne overlap with starting of courseTwo i.e. Before end of courseOne, courseTwo starts. We can write this check in code as. 4.) Start Overlap : When starting of courseOne is overlapped with ending of courseTwo i.e. courseOne starts before courseTwo ends. In coding we can write this conditions as. Finally you can write a complete method to check overlapping between two object as follows. // If any overlapping use case is true , method will return true. // Above code is two make it more readable and understandable, to optimize this use all of them in one If condition. i.e. This code can be changed as per your requirement, just grab this pseudo code and be a faster/smarter coder.